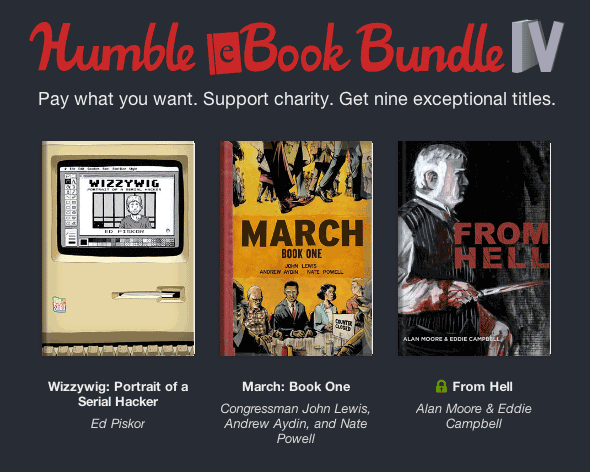 For the next two weeks, customers can name their own price for the bundle, which marks the first ever DRM-free release of Wizzywig by Ed Piskor and From Hell by Alan Moore & Eddie Campbell, plus March: Book One, the award-winning civil rights graphic memoir by Congressman John Lewis, Andrew Aydin, and Nate Powell. Those three titles alone are worth a cover price of $70, but the eBook Bundle also features work by many other authors, including George R. R. Martin, Neil Gaiman, Terry Goodkind, and Yahtzee Croshaw. What’s more, this project serves as a fund-raiser for both Doctors Without Borders and the Comic Book Legal Defense Fund. Upon purchasing the bundle and choosing how much to pay, customers can select how they’d like the funds to be split among the books’ creators, the two charities, and a “tip” for the Humble Bundle team.